Today, as in previous weeks, we’ll introduce a local firm that shined at the Korea Service Market. The company we’re talking about is BF Medical Group, which contributes to expanding hallyu or the Korean pop culture boom overseas into the area of medical treatment. Let’s hear from company president Kim Seong-hyo. Our affiliates are all optimized for the medical industry. BF Medical, for example, provides medical services, while BF Life Sciences is dedicated to the research and development of genetic testing. We also carry out the management service organization business, which is about hospital management support. The future medical industry will be shifting its focus to the anti-aging trend. With this in mind, another affiliate, BF Hillapi, is concentrating on anti-aging services. We also directly operate clinics in China. The healthcare group supports management of hospitals both in Korea and overseas, attracts foreign patients, conducts genetic testing, develops medical supplies and cosmetics products using advanced genome decoding technology and stem cell research, and provides anti-aging services. Based on its expertise on hospital management support, the company has also been exporting Korean medical services and equipment as well to promote the so-called “medical hallyu,” which is growing fast. Mr. Kim saw the potential of medical hallyu very early. Initially, I did the cosmetics business. 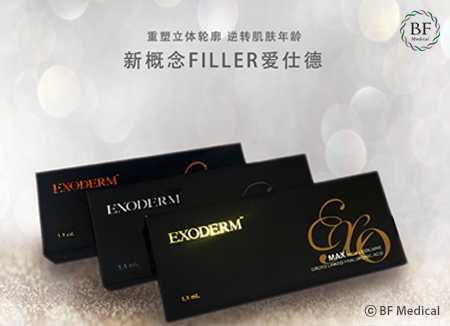 Before the hallyu boom spread, cosmetics products mostly targeted local consumers. But we had no place in the domestic market dominated by large companies. So, we decided to produce special cosmetics goods through research and began to produce cosmetics for medical purposes. It is well known that the level of Korea’s medical treatment is highly recognized the world over. Our business partners overseas admit that the level of Korean medical services is very high. Korea boasts advanced plastic surgery techniques and technologies, which are considered to be representative of the region. Many Korean doctors have excellent surgical techniques to deal with particular diseases, including cancer. No wonder that a lot of foreign patients are looking for Korean medical services and give them a thumbs-up. According to the Ministry of Health and Welfare, about 364-thousand foreign patients visited medical institutions in South Korea in 2016. It represents a six-fold increase from the 60-thousand in 2009, when relevant statistics began to be compiled. Not only patients, but a growing number of foreign doctors are also coming to Korea to learn medical skills. Some Korean medical institutions have advanced into the overseas market to directly operate hospitals abroad or treat local patients in foreign countries in the form of joint investments or under franchises. In other words, the medical institutions are transforming themselves into exporters of medical services. Mr. Kim recognized the high level of Korean medical treatment while producing hospital cosmetics, and began to engage in the management service organization, or MSO, business in 2001. Most hospitals deal with various affairs themselves, ranging from finance and tax to administration and marketing, and they find it burdensome to secure funds and manpower needed for handling them. But if a professional firm takes charge of management, the medical staff can concentrate on treatment, while patients will be more satisfied with tailored services offered by specialists. When foreign patients visit Korea for medical treatment, in particular, an MSO provider helps them find interpreters and accommodation—a service that hospitals find difficult to offer. From the initial stage, the company bravely tried to explore the foreign market. I’ve been doing the business for 17 years. When exploring the Chinese market in the early stage, we had to depend on local people. We provided them with everything they wanted, including money. One day, we suddenly lost contact with the Chinese, although we had already sent them money and the date of a contract was approaching. Of course, we failed to sign the contract. I felt an acute need for our own specialists. Without them, it would be difficult to showcase our expertise overseas. So, we made strenuous efforts for more than five years to build up our specialty. Over 90 percent of our employees are researchers specializing in medical management or services. The process took a long time, and we also need time to form close relationships with foreign partners and coordinate with them. Kim discovered the harsh reality in China. From then on, he selected specialists as employees and had all the affiliates concentrate on the bio-medical area so his company could provide local customers with anything they wanted. 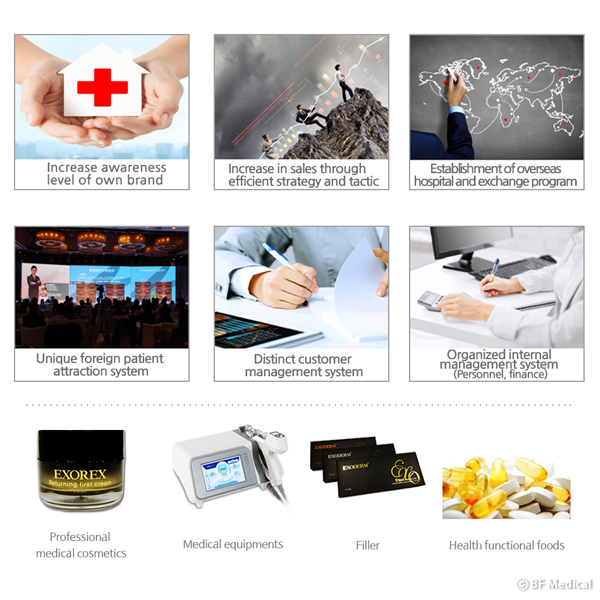 In 2013, the company established a customer-tailored, one-stop system under the name of BF Medical Group to approach the management staff of local hospitals with its tailored consulting service. It also developed an application that enables users to find information about Korean hospitals and reviews of those who used the clinics. Thanks to the app, foreign partners came to learn about Korean medical services more easily and correctly. 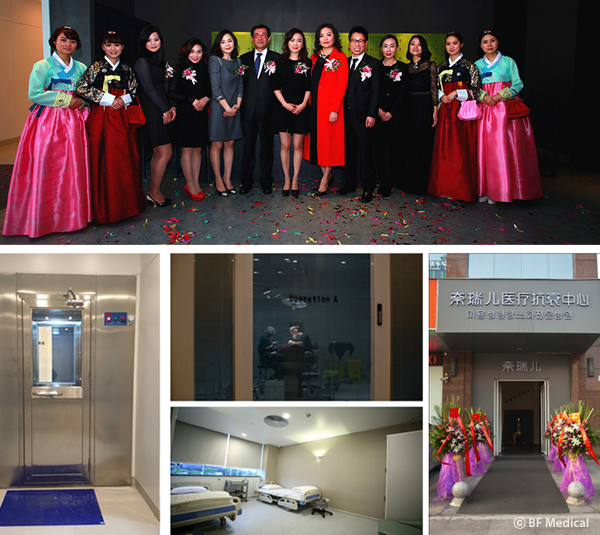 After ten years of hard work, BF Medical was able to bear fruit in the Chinese market. We directly run a hospital in China. There are plastic surgery, dermatology, dental and obstetrics and gynecology clinics at the hospital. We also operate hospitals jointly with Chinese partners. For the joint project, we provide Korea’s outstanding systems, techniques and services to the hospitals. So we run hospitals in China in these two different ways. BF Medical is successfully leading the medical hallyu sector, which is expanding the number and scope of foreign markets year after year.